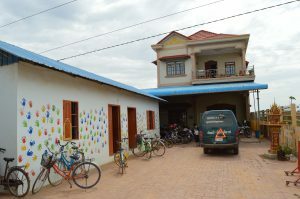 The English school – Kidshelp Kambodscha e.V. 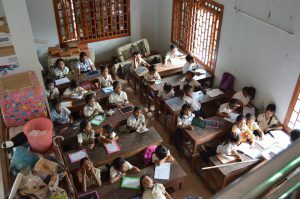 At the moment more than 400 children go to the English School in Lor Oet Village, Preak Dambang Province, where they are taught by nine teachers. The school has four classrooms inside the main building and some additional space for one more class in the foyer and the schoolyard in the front for up to two more classes. There is one more open air classroom at the back of the house that is protected from wind and rain by a roof and a wall and two more classes in our new front building. In the foyer there is also a library where the students have the opportunity to borrow books at any time. 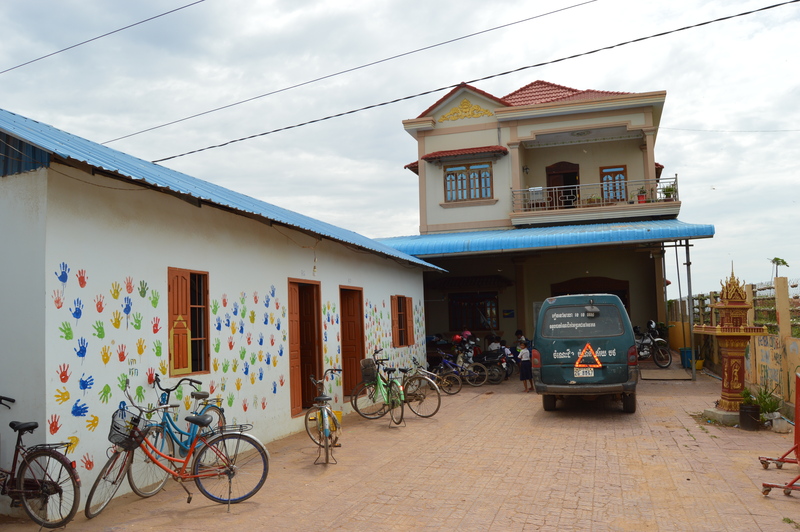 On the last floor there is the office of Kidshelp Kambodscha e.V., a room for volunteers and two private rooms of the family of our employee and school principal Khath Khemara and two rooms for Kidshelp volunteers. The students are taught in different groups according to the knowledge of English. The younger students (5-11 years) start with the so-called “Foundation-Courses” where they start with the English Alphabet but soon continue with English vocabulary and short sentences, even though the English grammar is not covered more intensively. For the older students (12-19 years) there are four different levels (Beginner, Elementary, Pre-Intermediate and Intermediate). In the „foundation courses“, the students use the “Up and Away” courses by Oxford University Press. In the advanced courses the students work with books of the “New Headway” series by the Oxford University Press which they can buy for 8000 Riel (around 1,75 €) per volume. The price for the full time courses vary according to the level, but the monthly fees between 2,50 US$ and 5,-US$ are very moderate. To make sure that all children have the opportunity to study English we provide free scholarships for more than 100 children. For a small monthly fee sponsors can help one child to visit the school for free (you will find more information under the button “Your Help”). 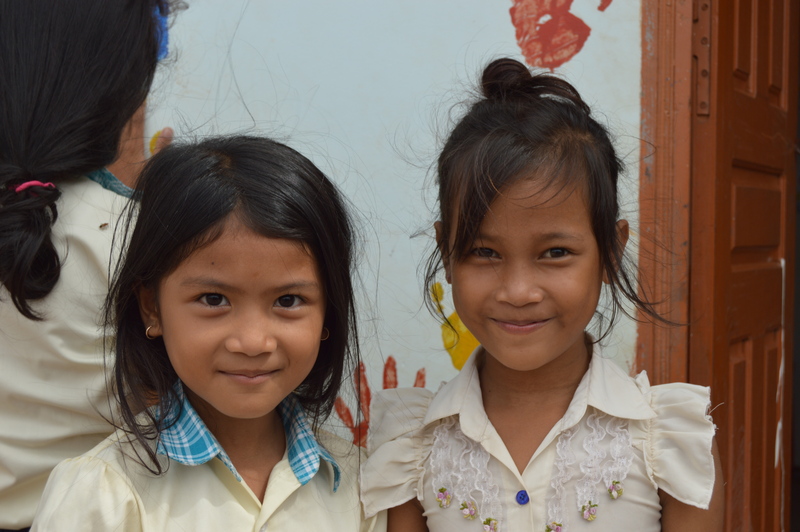 Our employees in Cambodia are in permanent contact with the supported families and they will make sure that only those who are in need and have the right ambition will be supported. 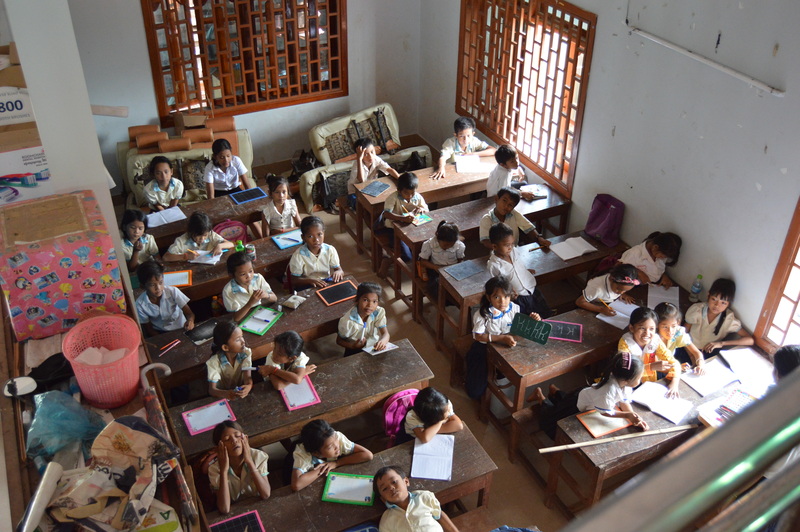 Cambodia´s education system is recovering slowly from many years of civil war and the epidemic poverty in Cambodia makes it difficult to provide good quality English classes. The normal training of the teachers lacks quality and especially in the countryside they have to struggle with big classes and bad materials. Most of the better teachers prefer to work in the cities. For these reasons we are trying to improve the quality of our teachers on our own with the help of our foreign and Cambodian employees. One example are the weekly trainings by our deputy principal Hun Tharith, a former teacher at a private school with high knowledge and great experiences, and the trainings of our volunteers. Apart from that, we always try to give outstanding teachers the opportunity to study at other institutes and universities. This improves the quality of our school and for the teacher it is a great incentive. At the moment three of our teachers study at universities in Phnom Penh. In return, they obligate themselves to continue working for our school for a certain period of time and therefore help us improving further. In the computer room there are eight computer sets with access to the internet. Our deputy principal Hun Tharith teaches the children basic computer skills. In most cases the handling of the computers has to be trained from scratch because most students have never used a computer before and every operation is completely new to them. The computer classes offer a couple of advantages for the students: through the work with the computers and the internet they can acquire new method skills that are becoming more and more important in Cambodian universities and work places. Furthermore they get to know the internet as a source for their own studies which can help them to independently deepen their knowledge. They can also, guided by investigation orders, improve their general education. Many students do not know much about the world outside of Cambodia. The computer room provides the only access to the internet for young people in the region. The digital age also starts in Cambodia these days which means that job offers are also posted online. That way High School graduates can get information about job offers online. In addition the internet offers the possibility of authentic communication with English speaking internet users worldwide. For a couple of years we at Kidshelp Kambodscha e.V. have been working with volunteers in our English school. Thanks to their commitment many processes got started that helped to improve the school constantly and in a sustainable way. Many of the older students took the courage to start talking English outside of their classes when they got into contact with young people of their own age from other countries. Most of our volunteers come to us after they graduate from high school. At our school they have the chance to use the experiences from their own English classes and pass them on to our teachers. Most of our teachers also benefit a lot from the cooperation with the volunteers and in the last years the classes at our school became much more diversified. Apart from their positive influence on the classes, both sides benefit personally from these short term services. New friendships with students and teachers were formed and both parties were able to broaden their horizons. Therefore we try to have two volunteers at the school at all times. Two things are crucial for the work at our English school. First of all it is important for us that all children and young people who live close to our school can study there if they want to. On the other hand it is also important for us that all donations are used in a responsible and targeted manner and the school does not become too dependent on subventions. Therefore we decided to charge a small school fee from those students who are able to pay for the classes. The costs of 2,50 US$ to 5,-US$ depending on the level, are very low, even by Cambodian standards. Nevertheless, there are still families who cannot even afford this small fee. Our scholarship programme aims at these children. Four Euros per month make sure that one child can visit the school for free. This helps that even the poorest get the chance to improve their future opportunities by studying English.